The harp is probably the most beautiful and graceful of all musical instruments; not only is it a delight to the eye, but the music that pours forth from it is incredibly romantic and soothing. Plus there’s an added bonus: live music that nobody has to scream above in order to be heard! Imagine having a gorgeous, custom made, one-of-a-kind harp at your wedding! Let David M. Ice add an elegant touch of class to your wedding or special event, making it even more memorable. 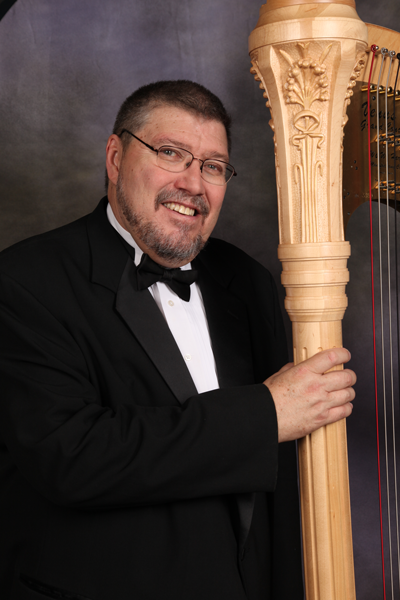 David has presented seminars at several National Conferences of the American Harp Society, the World Harp Congress, and has been a guest lecturer at harp festivals around the world, including Adelaide, Australia; Copenhagen, Denmark; Dublin, Ireland; Austin, Texas; Tulsa, Oklahoma, and at the Royal Academy of Music in London, England. In addition, his harp arrangements are played by harpists the world over, and he has been a featured columnist in The Harp Column magazine. David has an extensive repertoire of classical and tasteful popular tunes perfect for all occasions, including all of the traditional bridal marches and recessionals. Discreet and inconspicuous amplification is available. And if you’re planning an outdoor event such as a wedding, reception, or memorial service, a Harp is much more transportable than a piano or organ!